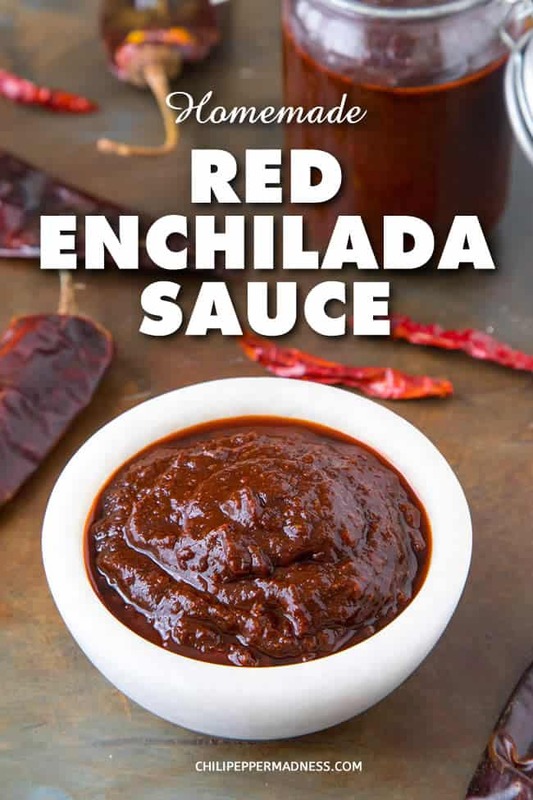 This authentic red enchilada sauce recipe is made with a mixture of Mexican chili peppers that are lightly toasted then rehydrated and processed to form a deeply rich and flavorful sauce. It is one of my very favorites for homemade enchiladas. I have to admit that I’m kind of a red enchilada maniac. I’ll take them any way I can get them – with chicken, vegetarian style, stuffed with cheese, pulled pork, ground beef, however you want to serve them to me. Just gimmee, OK? It’s really about the sauce. Red Enchilada Sauce, when made from dried Mexican chili peppers, is one of those sauces that can’t be beat. It is deeply rich and earthy and so massive with flavor, it is difficult to describe how satisfying it truly is. I think mankind must have been doing something right in its early days, and the Gods smiled down and said, “Yo, let’s reward you with something for good behavior. Boom! Here is some red enchilada sauce.” Thank you, ancestors. I have enjoyed numerous red enchilada sauces in restaurants all over and from friendly kitchens. I’ve also made them several different ways, and this particular recipe is my own preferred method. There isn’t anything crazy about it, no wild ingredients or steps to follow, just simple ingredients and tried-and-true cooking. Why mess with perfection? Still, you can easily customize this recipe, and I’ve included some ways you can adjust it to your own preferences, because, honestly, playing with recipes is fun. 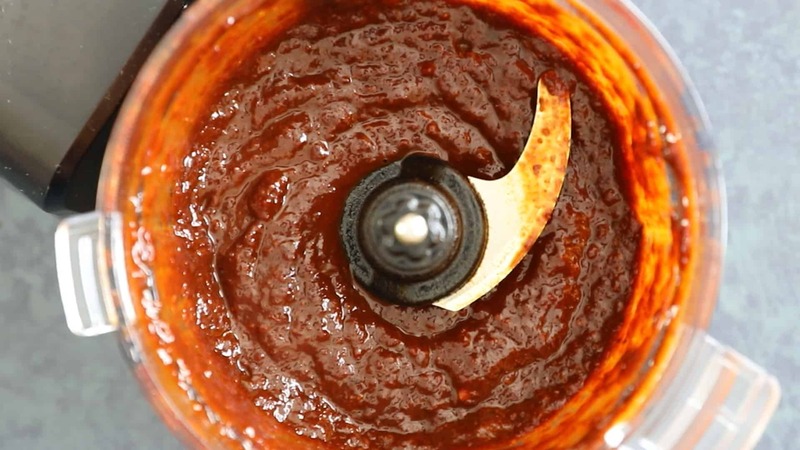 So let’s talk about how we make this awesome sauce, shall we? First, heat a large pan to medium heat and dry toast the dried chili peppers a few minutes per side, until the skins begin to puff up a bit. This is an important step, as it helps to release the oils in the skins, which is HUGE for flavor. Set the peppers into a large bowl and pour hot water over them, just enough to cover them. Let them soak for 20 minutes, or until they become very soft. 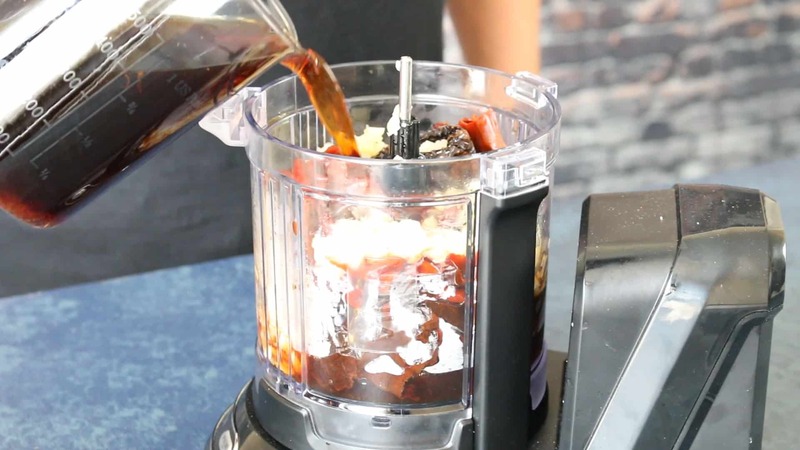 Remove the softened peppers and set them into a food processor or blender. Next, pour in some of the soaking liquid. You’ll notice that it has become quite dark from the peppers. This water has plenty of nutrients leached from the peppers, so I like to use it. You can also use clean water if you’d like. Add about 1 cup to start. Next, cook down some onion and garlic in a pan with oil, then add them to the food processor along with the rehydrated peppers. Add sea salt to your preference. Process the mixture until the sauce becomes very smooth. It will be very thick at this point. Add in more water, a half cup at a time, until you achieve your desired consistency. Gorgeous, isn’t it? So rich and vibrantly red. You can strain the sauce at this point if you’d like. I usually strain mine for a smoother sauce, though it isn’t 100% necessary. The red enchilada sauce is good as it is, but there there are some slightly bitter notes from the skins that can be somewhat tempered from straining. 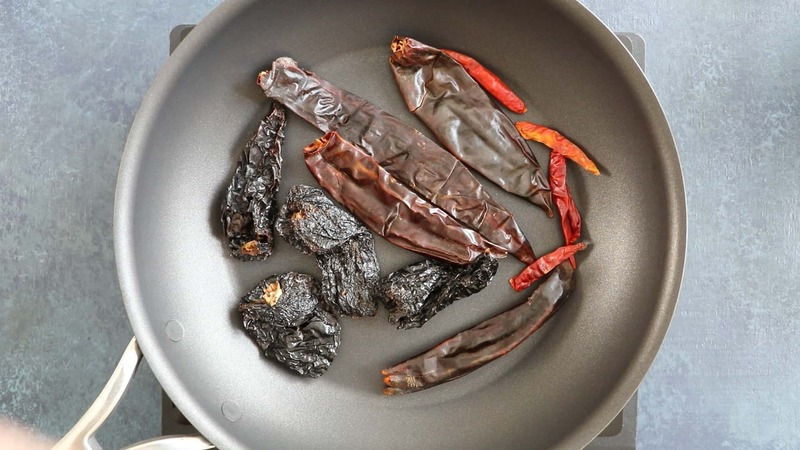 For my preferred recipe, I use ancho chili peppers, guajillos and chiles de arbol. All are readily available from nearby grocers, or you can find them in Mexican grocers. If you’re unable to find them, purchase them online. You can get large bags of them and use them all the time like I do. Ancho peppers are dried ripe poblano peppers, and I’d have to say they are very easily one of my very favorite chili peppers to cook with. They add a complex richness you can’t find anywhere else. 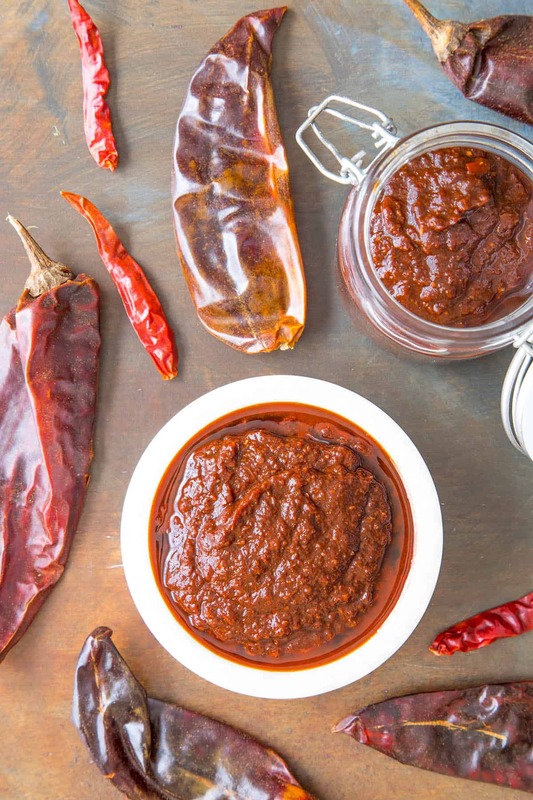 Guajillo peppers are one of the most common and popular chiles grown and used in Mexico. They add a slightly berry-like flavor to the dish, along with a gorgeous deep red color. Chiles de Arbol are small and thin Mexican peppers, growing to 2-3 inches long and less than a ½ inch wide. They are a bit hotter for that touch of heat we’re looking for. Adding tomatoes, tomato sauce or tomato paste is a popular variation. Tomato adds a nice touch of sweetness. Traditional, authentic red enchilada sauce does not use tomato, but it really does add an interesting flavor dimension. Give it a try for sure. If you feel the final sauce is too bitter, you can sweeten it up with a bit of honey, agave nectar, sugar, or even chocolate. I’ve tried recipes with dark chocolate and they are very good. You don’t need much, just a little. Fry the Sauce. Some cooks like to cook the sauce in a bit of oil in a pan, essentially frying it, to further develop the flavors and more. I’ve tried this and like the results, so it’s worth a try. Seasonings. 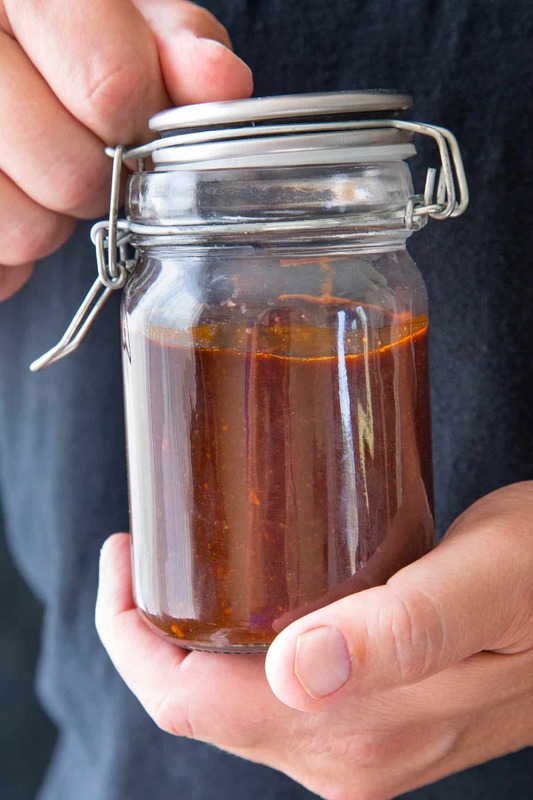 You’ll get LOADS of FLAVOR from this recipe the way it is, but you can easily adjust with other ingredients, like cumin and other chili powders, and particularly herbs like Mexican oregano, marjoram or basil. 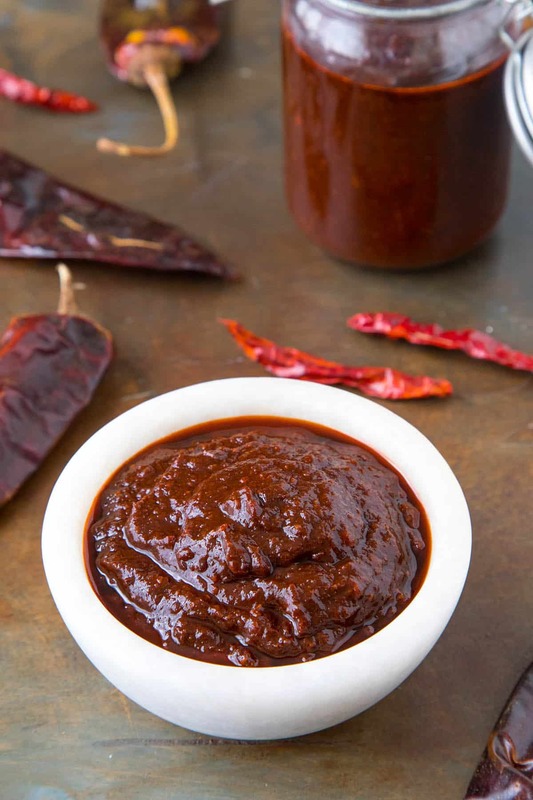 The flavor of this red enchilada sauce is slightly smoky and the color is deep, deep red. I hope you enjoy it. I’m the biggest fan of tomatillos so I’ve always gone for the Green Enchilada sauce. But since the Red Enchilada sauce is predominantly made from chili peppers, it was a no brainer for Mike to make this sauce as well. And I realized that there actually is something out there as good as the Green Enchilada sauce. I may be won over to the other side. Dry toast the dried chili peppers in a heated pan over medium heat. Toast them a couple minutes per side, until they start to puff up slightly. Cool, then set them into a heavy bowl with enough hot water to cover them. Let them soak for 20 minutes, or until they become very soft. Remove them and place them in a blender or food processor. Reserve 1 cup of the dark soaking water. In the same heated pan, add the olive oil. Cook the onion about 3 minutes, or until they become translucent. Add the garlic and cook another minute, until they become fragrant. Add them to the food processor along with the sea salt. Pour in the reserved soaking liquid and process to form a sauce. It will be very thick at this point. Add in more water, a half cup at a time, until you achieve your desired consistency. Strain, if desired, and serve as needed. Keeps about a week in the fridge. Freeze it for longer storage. Can you preserve it in jars? Sommer, yes, you can either jar this and use a water bath to preserve it, or a pressure canner. Be sure to check the ph, though. It should be 4.0 or below (preferably 3.5) for home preservation with the water bath. If it’s higher, use a pressure canner. You can always lower the acidity with a bit of citrus or vinegar. Let me know how it goes for you. 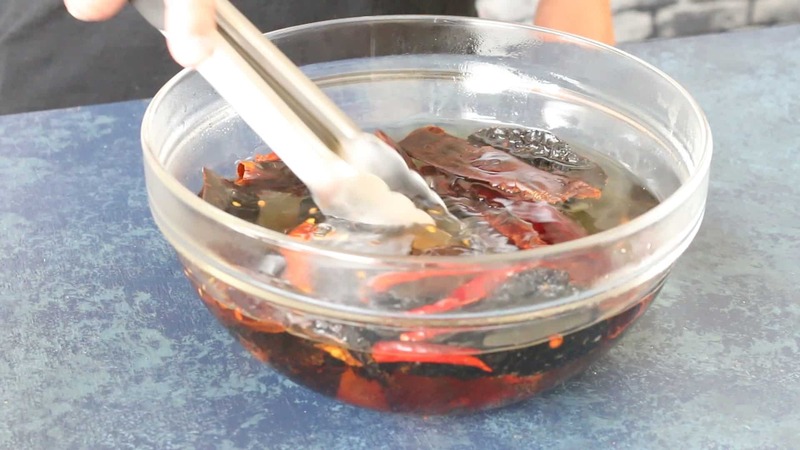 Can you use fresh picked chili peppers? Peter, you can, though I think it would be better with fresh peppers. If you use the pickled, let me know how it turns out for you. Enjoy! Such a great looking recipe! Loving how this looks. The family is going to love this! Thanks, Billy! It is super delicious for sure. We are living in Playa del Carmen Mexico. There are tons of dried peppers down here, but no chili powder! I finally got it, you have to make your own! And what a better product when you make it yourself. And only pennies (pesos) to make. I do like to use the chili paste too. I have only recently discovered that. Canned tomatoes are very rare here too. I have found romas for 2 lbs. for $.75, so we make our own. Love your blog. Thanks for writing it. Awesome, Nora. 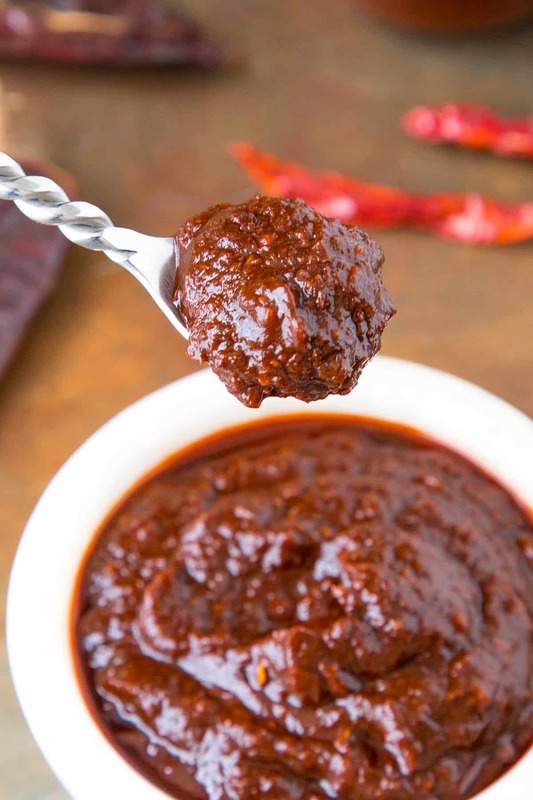 Yes, homemade chili powders are SO GOOD! Truly. I love that. Surprised you can’t find a local source for it in Playa del Carmen. This is probably the best version of this sauce I’ve ever tasted. It’s the only way I make it now. Thank you dearly! Thanks, Charles! It’s my favorite, too!